A Halifax man who was locked up last month for a knife attack is challenging the sentence he received from a crown court judge. Akaash Ibrar, 19, was sentenced as a dangerous offender after he slashed Bilal Ahmed’s face with a knife during a street confrontation last July. Mr Ahmed needed 70 stitches in the wound and Ibrar, of Paddock Lane, was given an extended sentence of six years for causing grievous bodily harm with intent and affray. 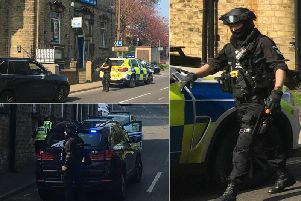 But his case was listed again at Bradford Crown Court yesterday (Thursday) after a query was raised about the precise terms of the sentence, which also included a six month consecutive term for possessing an offensive weapon at the time of his arrest. Ibrar was not brought from custody for the short hearing, but his solicitor advocate Stephen Uttley revealed that the case was the subject of an application to the Court of Appeal. Mr Uttley said the appeal was based on a submission that the sentencing court was wrong to conclude that his client was dangerous. No details were given in court about when the appeal hearing was likely to take place.